Direct for the purpose of promoting peaceful action on more local fronts. 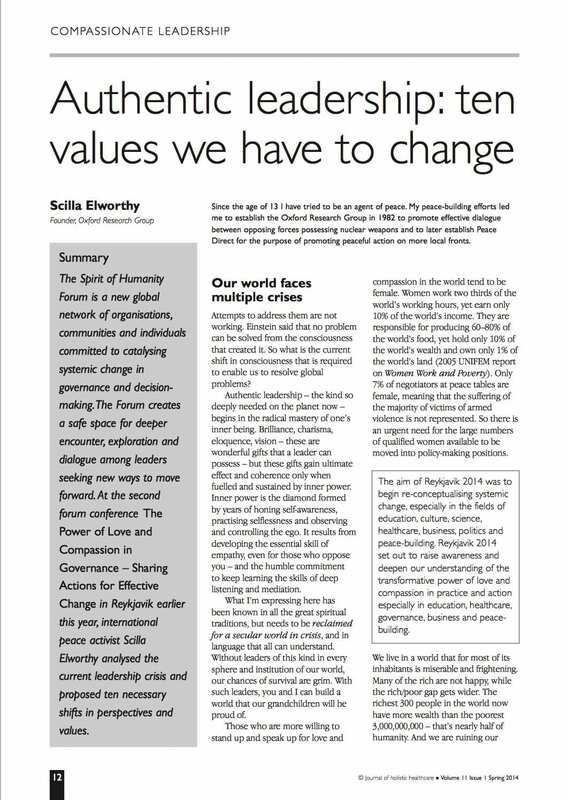 The Spirit of Humanity Forum is a new global network of organisations, communities and individuals committed to catalysing systemic change in governance and decision- making.The Forum creates a safe space for deeper encounter, exploration and dialogue among leaders seeking new ways to move forward. At the second forum conference The Power of Love and Compassion in Governance – Sharing Actions for Effective Change in Reykjavik earlier this year, international peace activist Scilla Elworthy analysed the current leadership crisis and proposed ten necessary shifts in perspectives and values. listening and mediation. What I’m expressing here has been known in all the great spiritual traditions, but needs to be reclaimed for a secular world in crisis, and in language that all can understand. Without leaders of this kind in every sphere and institution of our world, our chances of survival are grim. With such leaders, you and I can build a world that our grandchildren will be proud of.